Packed with trailing flowers, these Mother’s Day baskets are meant to be shared. THIS YEAR, INSTEAD of buying Mom a hanging basket for Mother’s Day, surprise the living tweedle out of her by teaming up with the kids to create your own masterpiece. For extra fun, choose trailing flowers that attract hummingbirds, and hang the planter near a window, where the whole family can watch the little avian aviators visit the flowers. Begin by choosing a hanging basket (equipped with drainage holes) that matches the décor of your house. While you’re at it, pick up some potting soil. If you don’t want to bother applying fertilizer every week or two, buy soil-amended, slow-release fertilizer. The fun part is choosing the plants. 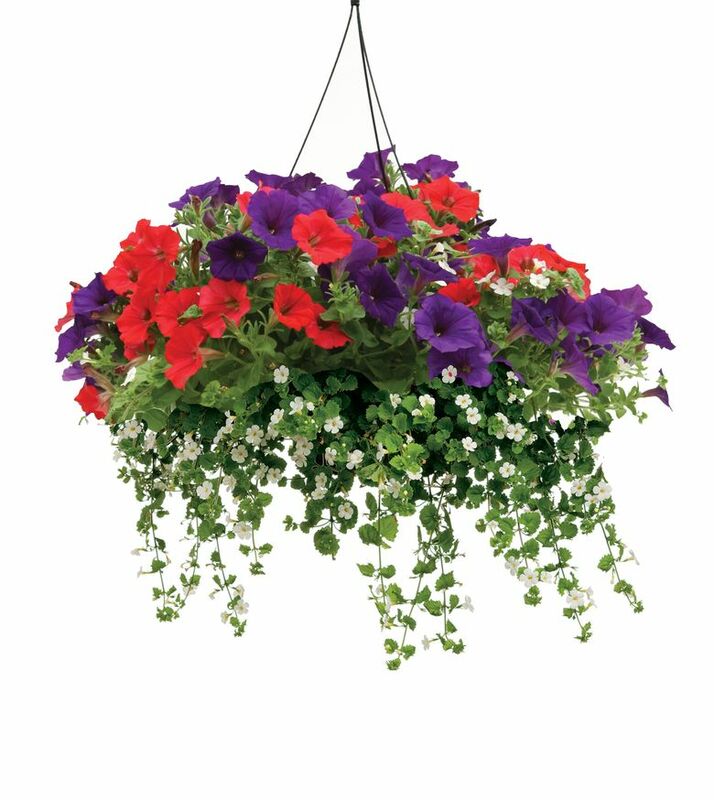 Mother’s Day is generally considered the date when you can plant annuals without worrying about cold damage, and right now, nurseries have a great selection of annuals that work well in hanging baskets. Cram the basket full for an instant display. You might want to choose just one kind of trailing plant, or you can mix and match to create a wildly colorful display. Two great choices, used singularly or mixed together in a hanging basket for a sunny location, are trailing petunias and Calibrachoa (Million Bells). Both of these plants produce colorful, funnel-shaped flowers filled with nectar that hummingbirds can’t resist. Petunias have the bigger flowers, and varieties with darker-colored blooms usually are wonderfully fragrant in the evening. 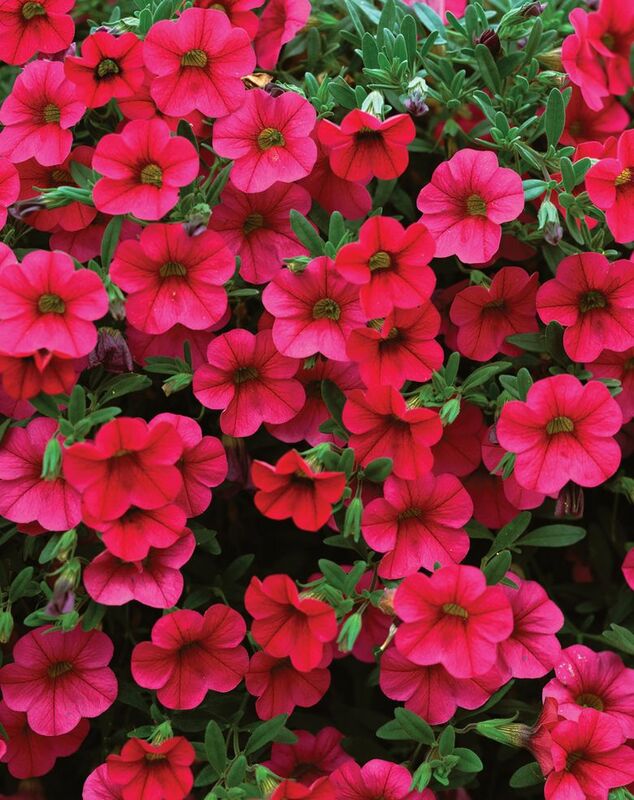 The flowers on Calibrachoa resemble little petunias and lack fragrance, but this annual produces an amazing number of blooms that come in a multitude of electrifying colors. To look their best, petunias and Calibrachoa require fertile soil and regular watering. Petunias produce better if spent blooms are removed on a regular basis. The vines should be cut back by half to stimulate increased flowering right after the main bloom period ends in early July. Calibrachoa doesn’t require deadheading, but pinching back overly long vines will encourage more compact growth. Another sun-loving vine with amazing hummingbird appeal is nasturtium (Tropaeolum majus). The flowers come in a vast array of colors, and the unusual large, round leaves are attractive in their own right. Deadheading isn’t necessary, but keep an eye out for black aphids hiding under the leaves, and blast them off with a powerful spray from the hose, or squish them with your fingers the minute you spot them. Left unchecked, they can build up to huge numbers that quickly will ruin the display. Other sun-loving hummingbird favorites that look great in combination or solo in a hanging basket are Cuphea, Verbena and Lantana. 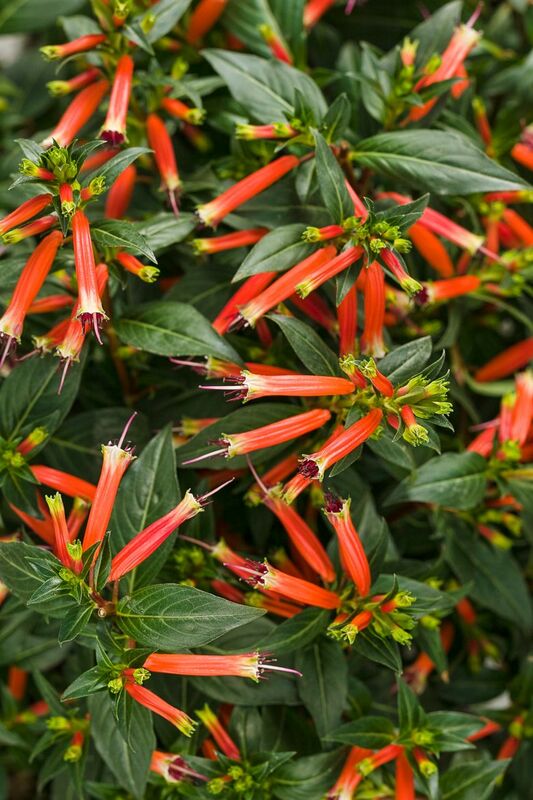 Cuphea is a real cutie, featuring a gazillion small, tubular flowers that are produced all season long without deadheading. The variety ‘Bat Face’ features inch-long purple and cherry-red tubular flowers that really do look like little bat faces. Trailing Verbena, or its close relative Lantana, produces profuse clusters of small, nectar-rich flowers that bloom nonstop and come in a wide range of hot and cool colors. 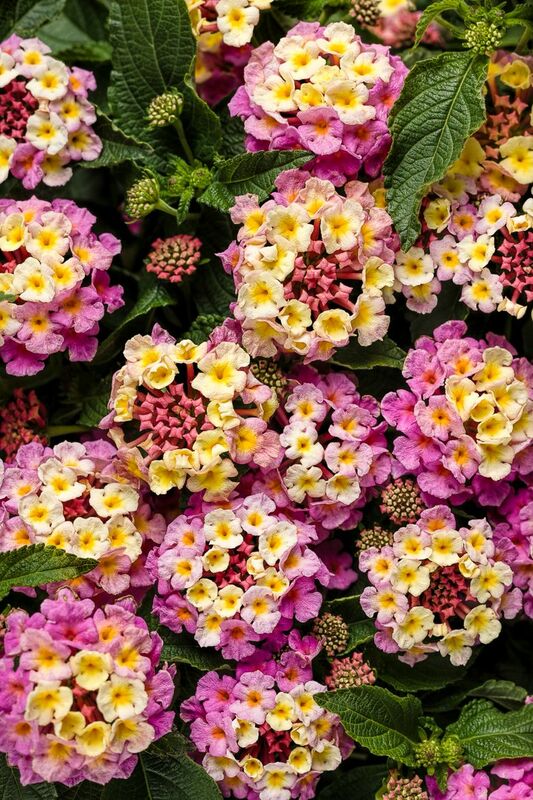 Some varieties of Lantana have white, yellow, orange, red and purple flowers mixed in the same cluster. Finally, if you lack sun, there are shade plants that look great in hanging baskets as hummingbird magnets. 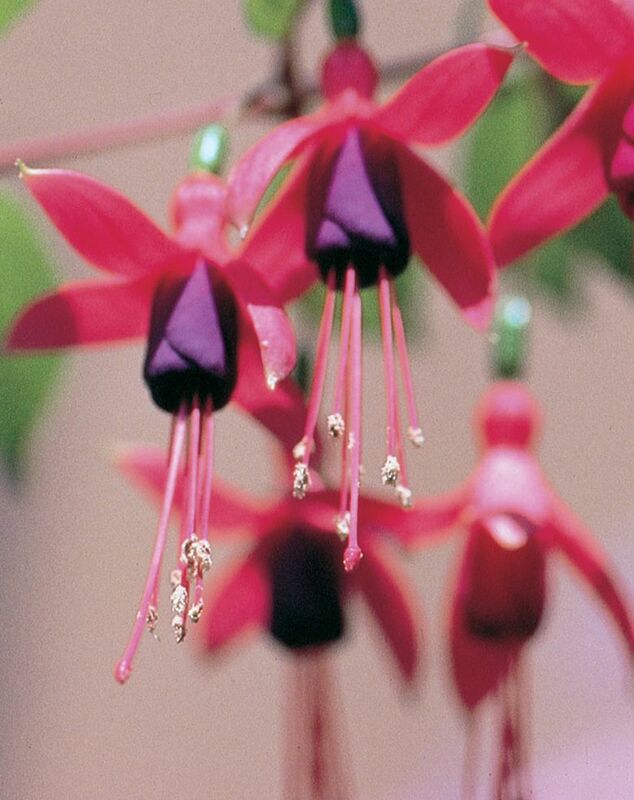 Few plants can match the elegant beauty of a trailing fuchsia. As long as it is well-fed, watered and deadheaded regularly, your fuchsia will keep producing its beautiful two-toned blooms late into fall. If you want to attract hummingbirds, choose a variety with single flowers — most of the double-flowering ones produce little if any nectar. The other shade plant that hummingbirds go ga-ga over is the newly introduced ‘Fanfare’ series of trailing impatiens. The only maintenance required is to shear back any stems by a third if they begin to look leggy. Warning: Wear a hard hat when you cut back stems to promote blooming in your new planter. Rufus hummingbirds have been known to divebomb anyone they think is stealing their cherished flowers.